If you collect teapots (as I do), you're likely to love Zoraida Payne's hand painted teapots and glassware. Her's is an intricate and stunning art, and we are lucky to have one of her pieces up for a giveaway this week! I truly envy whoever wins the teapot above! For a chance to win an amazing original teapot for yourself, please visit the shop and leave a comment below letting us know which other item you love most from Arte de Zoraida (mandatory). *Congratulations to our lucky winner, Laura! I love the Handpainted Teapot!! The Apple green Price and Kensington teapot is so pretty. I love the shade of green the artist chose, it's very "happy". I follow Haute Whimsy on Twitter as@lifesdeepcolors. Left a comment on a great post! I follow this blog via GFC! 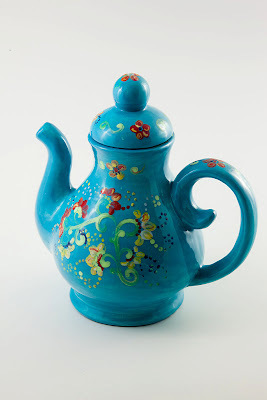 Like Haute Whimsy on Facebook-gloria m.
I like the hand painted teapot with flowers. i love the Handpainted Teapot with Flowers, such pretty colors! I like Haute Whimsy on Facebook. The hand painted wine glasses are very pretty! I love the Handpainted Teapot with Flowers! Added Arte de Zoraida and HauteWhimsy to favs as BeeZeerArt and liked HauteWhimsy as BeeZeeArt on facebook. I follow you on GFC as sweetsue. I follow you on twitter as ptowngirl25. Christina - xristya@rock.com - I love the Red Hand Painted Wineglass! I commented on the Cheesecake post! I like the Hand painted Flowery Vase. I love the Red Price and Kensington teapot! I love the hand painted wine glass. The Handpainted Teapot with Flowers is also beautiful. I like the Red Handpainted Wine glasses. I follow on Twitter as Bookloon. My favorite is this one. I added Haute Whimsy to my favorites on Etsy. I added Arte de Zoraida to my favorites on Etsy. I love the Apple Green Handpainted Teapot with Flowers! I follow Haute Whimsy through GFC. I love the The Apple green Price and Kensington teapot! what can i say! I'm obsessed with green! I liked the FB page. I followed HauteWhimsy on twitter. I love The Hand Painted Wine Glasses! I commented on the blog post. i love the red Handpainted Teapot with Flowers. I love the green tea pot! So cute! liked Haute Whimsy on facebook as Sasha L.
I love the orange/teal/green wine glasses. Beautiful work! I love the Handpainted Teapot with Flowers, Ready to Ship, the bright green one. I like the Handpainted Teapot with Flowers. I like the Red Hand Painted Wine Glass. •Leave a comment on a Whimsy Diet blog post (unlimited!) done! Thanks for joining my blog, Jen.